Finally got some time with Skyward Sword this week. I believe I’m wrapping it up and if correct, I should complete it this week. There’s been a lot of information dropped on me in the past couple of hours. Nintendo seems to put a lot of thought into the general history of each Zelda game’s universe and when this information becomes clearer, I always make sure I’m paying attention. Other than that, my friend and I dabbled with about a half dozen games, attempting to pick one to play through. We weren’t successful but two standout games were Odama (GameCube) and Mystaria: The Realms of Lore (Saturn). Odama is super weird for a few reasons. It is basically a pinball game set in feudal Japan but there are also elements of army management. Another weird thing: it’s controlled nearly exclusively with a microphone. I thought it was fun, but I got frustrated at it easily. I’ll definitely put more time into it. I think the US box art is very bland. They should have used Yoshitaka Amano's art. 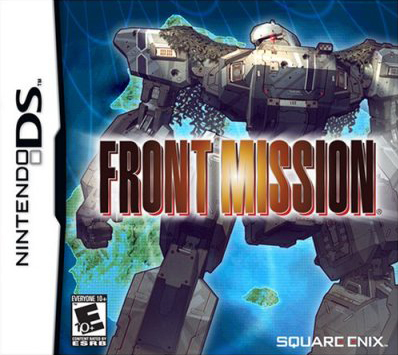 The 2007 Nintendo DS release of Front Mission was the first time the game was available in North America. It was originally released for the Super Nintendo in 1995 and saw upgraded ports for the WonderSwan Color and PlayStation in the years before it arrived here. The game spawned a series and is undoubtedly one of the more well known tactical role-playing games. Front Mission contains two lengthy scenarios to play through, each taking place on Huffman Island. 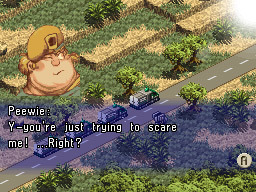 The game has a very detailed back-story detailing the events that led up to the confrontation of two superpowers on a small Pacific island in the late 21st century. The first scenario follows a young captain, Royd Clive who is fighting as mercenary for the Oceania Cooperative Union. When his scenario begins, I witnessed his fiancée getting killed by opposition forces, the Unified Continental States. He loses interest in fighting but is recruited by a mercenary leader and accepts. Through his conquest of the island he receives indications that his fiancée might still be alive. The second scenario follows Kevin Greenfield, a former high ranking officer in the U.C.S. who was stripped of his rank and sent to Huffman Island. This scenario was labeled as more difficult than Royd’s and I didn’t play any of it. Heck, I didn’t even finish Royd’s scenario; I’ve played for about a dozen hours and I’m basically halfway through his scenario at mission 13. I spent the bulk of my time with Front Mission when I spent a week away from home, away from my consoles, and I haven’t put much time into it since then. Perhaps I would’ve remained captivated by it if there was more going on plot wise. Most of the plot advancement stemmed from minor victories against Royd’s enemy, the U.C.S., allowing his squad to gain ground on them. Also going on was Royd’s quest for his possibly still alive fiancée but this plotline developed very slowly. Recruiting new squad members introduced new characters, but I rarely saw them afterwards. The wanzers could equip many different types of weapons so having a diverse squad helped. Personally, I really like tactical-rpgs… from afar. Leveling up and managing a fairly large squad sounds interesting, but this eventually amounts to too much work. Another thing I dislike about the genre is the sense that there is one correct way to complete a mission; it seems I get halfway through a game and all of a sudden hit a wall. This is one area where Front Mission appeals to me. I never felt like there was one way to complete a mission. Perhaps this is due to the upgradability of the wanzers. Battles were fought in wanzers (mecha) which could be upgraded in many ways. When I wasn’t in a mission I could set up camp in a nearby town and visit the local shop. Here, I could upgrade the weapons my wanzers had equipped and change their various parts. When I ran out of money I visited the arena and easily won more by gambling. However, this turned into a rather boring cycle of mission, new town, shop, arena, shop, and so on. Recently, I’d spend upwards of thirty minutes upgrading my wanzers, and that’s too much downtime. 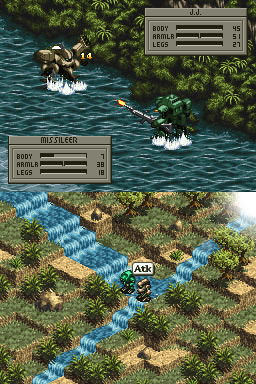 The actual missions in Front Mission are turned based and battles take place between individual units like most other tactical-rpgs. Some missions have unique events and enemies, but there isn’t much diversity apart from “attack all units until dead”. I enjoyed meeting new squad members and hearing from them, but they didn't add much. Front Mission belongs to a genre I guess I don’t particularly enjoy but I found it more approachable than other similar games; then again I still didn’t complete it, as of this writing at least. I found the gameplay solid and very rewarding when the tides of battle were in my favor. I wish there was more to the plot, either the actual confrontation between the two superpowers or Royd’s story. Just the thought of a whole other scenario is daunting, but surely a boon for any fan of the genre. Played a ton of games on Halloween, pretty much everything in this article. My friend and I focused much of our attention on Fester’s Quest and Juggernaut; both very good games to play on Halloween. I played a fair deal of Batman: Arkham City last week and I finally posted my review of it. Like last week, I hardly touched Front Mission so basically done with it at the moment. I just don’t have enough time! There are still a few more big releases slated for the remainder of the year, but the only one I’ll get right away will be The Legend of Zelda: Skyward Sword. I’ll pick it up when it releases on November 20. I am interested in The Elder Scrolls V: Skyrim so I might pick that up after I complete Skyward Sword. It was fun to get caught in the new release whirlwind this year. Even though I only picked up Gears of War 3 and Arkham City, I I feel like I’ve participated in way more conversations at work and allowed myself to get caught up in the moment. There’s been so many stellar titles released this year that I want to go back and play, but there’s so little time. Lastly, what’s up with the earthquakes in Oklahoma? I actually live a mile or two away from this place and was lucky enough to have taken a tour. I learned a good deal about earthquakes and that they do happen in Oklahoma, but the two that happened over the weekend are the first I’ve actually felt. It was so surreal. Still no Batman: Arkham City review, but it’s coming! My time was mostly devoted to school last week. I finished up a month long assignment dealing with the different accounting cycles a business goes through and it was a doozy. The day before it was due I worked on it no less than six hours, plus another three the day it was due and considering all the work I’d done on it prior to then, I probably spent thirty hours completing it. It got done. I played a good deal more of Arkham City. I ‘m nearly finished with the side quests but I still have a lot of Riddler related stuff to do. Add in the challenge rooms and I still have a bunch to do. I did get a little time in with Front Mission but not enough to mention it, other than saying I played it of course. That’s everything I suppose. Now’s a good time to finish my Arkham City review. Man is Batman: Arkham City good. I plan on writing a review this week but the contents are pretty much going to be “man is Batman: Arkhamy City good”. Besides my limited work obligations during the week and my limited schoolwork thanks to fall break, I dedicated whatever time I had to Arkham City, and I completed it last week, but I’m going to play through it again thanks to the new game plus feature. Besides that, there are so many Riddler-related items I have left to track down and I plan on completing 100% of the game. Lastly, there is a mode dedicated to challenge rooms (fighting dudes and stealthily taking out dudes) that I haven’t sunk a ton of time into yet. Along with the demos I wrote about, Batman: Arkham City was pretty much it. I played a little bit more of Front Mission but that just got overshadowed this week. Not much to report today. My girlfriend and I got around to nearly completing The Legend of Zelda: Four Swords Adventure, like one stage and a Gannondorf battle away from completing it, but no dice. I also put in plenty of hours into Front Mission and I’m still sticking with it surprisingly. That’s kind of it. We had to house/dog sit for her grandparents so I was away from my home for the majority of the week, but I did get some time in with a few demos. We went to the movies last night and watched The Thing. It’s a prequel to John Carpenter’s 1982 film The Thing. I’ve developed a crush on the film primarily because of the 2002 video game, which I reviewed earlier in my blog, here. The new film serves as a prequel and it was okay. It was quite similar to the 1982 movie, playing out in the exact same way, but it was still suspenseful. The night before that we went to the opera. It was my first time going and it was very cool. Most of the patrons were sharply dressed and the venue was packed. We went to the Tulsa Performing Arts Center and watched their presentation of The Barber of Seville. It was sung in Italian and it was difficult to see the subtitles from where we were, but it was easy to keep up after reading a synopsis. The show was pretty funny with some modern day references thrown in occasionally and the actors were terrific, fantastic singing. The orchestra was awesome too; many of the songs were familiar so I’ve probably heard them in Looney Tunes cartoons. So that’s some of the fun I had last week. I also worked my tail off for school, taking two exams and making progress on a large project for Accounting Information Systems, and that’s what I’m going to work on now. I guess I did have a lot to report. Just a few demo impressions last week. Besides playing those I also got a chance to check out the Battlefield 3 beta. I honestly didn’t play it that long so I didn’t get a good enough impression of the game, but it seems like a good first-person shooter. All that was available was one mode on one map in the game’s multiplayer. It was fast-moving and I liked that you could spawn on teammates as well as the effect flashlights and lasers had on my vision, but like I said, I didn’t play it long enough to write anything about it other than this. My friend and I completed Gears of War 3 last week. I was satisfied with the game’s ending and can’t believe I’ve completed the trilogy, although I’m sure they’ll make more eventually. Hopefully I’ll be able to write a review for it this week, but I fear I’ll be at a loss for free time. But here’s a preview: Gears of War 3 is more Gears of War, but it’s as solid, if not actually a little better, than it ever was. I’ve also stuck with Front Mission. I’m a few more stages into the game so I haven’t really progressed that much since last week, but it’s starting to give me more options, like what I can buy. Hopefully I’ll post a Gears of War 3 review this week, but no promises.